These XTRATUF Performance Series 6" Men’s Full Rubber Ankle Deck Boots are flexible and durable enough to handle the athleticism of offshore angling. You’ll be able to keep your footing in the slipperiest of conditions with the unparalleled traction of XTRATUF's signature non-marking Chevron outsole. 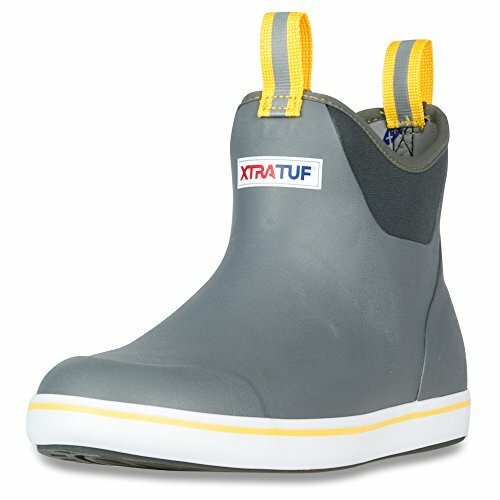 Lightweight and 100% waterproof, these gray and yellow fishing boots feature an XpressCool antimicrobial liner for breathable comfort, and convenient rubber grips for easy on and off. At just 6 inches high, these deck boots offer sporty slip-on-and-go styling perfect for on-the-water athletes.